WordPress is one of the most popular websites building applications. It is so versatile that is can help you create virtually any website you see on the Internet. It has the largest community and people from all over the world create new plugins, themes and help make WordPress even more secure. Making changes to its functions almost daily has both benefits and negative. In this article, we will focus on the WordPress Error 500 debugging and more specifically how to use the error_log file that is located in your WordPress files and how this log can make your life easier when finding critical errors in your website. There are many reasons why you can receive a 500 HTTP Error on your WordPress installation. 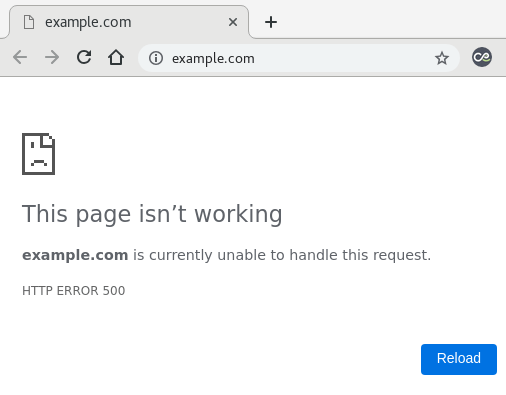 We will try to explain how to debug your website by using the error_log file and listing the most common reasons for you to receive an Error 500. In most cases when you receive the following on your site looks this way. This might be very frustrating as for a beginner user, this error does not show anything. Your site is not working and you might panic. It could also be due to an incompatible PHP version, for example, some of your Plugins or even your Theme could’ve been created to work with older PHP version (like 5.6), in this case, you can try changing the PHP version of your site. You can take a look at how you can change the PHP version for your account from our article here. The error_log file is standard for any PHP application including WordPress and it helps troubleshoot runtime errors by showing you exactly what happened wrong. As WordPress is PHP based application the error_log file can greatly help us indicate why we’re receiving an Error 500. What is the error_log file location? This will enable visual displaying of some errors on your WordPress site. If the issue persists you can always contact us for further assistance, our team is here for you! WebHostFace offers excellent WordPress web hosting packages at a very affordable price. Start your new project or transfer your existing websites to us – our hosting packages now come with 90% discount OFF the regular price! Copyright © WebHostFace.com LLC 2013-2018. All rights reserved.